In 2008 more than 50% of all US harvested cropland grew only two crops – corn and soybeans and more than 40% of the food calories consumed worldwide came from just three crops: wheat, corn and rice. 30% of Detroit residents receive food stamps, but 92% of Detroit’s food stamp retailers offer few or no fresh fruit or vegetables. There are now 8000 farm to school programs across the US. Eight years ago there were only 4. There are now 6000 farmers’ markets in the US three times as many as in 1995. 330 hospitals in the US and Canada have pledged to purchase food that is grown according to Fair Food principles. 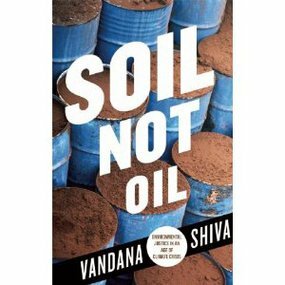 In recent years a number of books and films have documented the dangers of our current food system, and a number of those have been featured on Free forum. Just as you can’t alter the course of climate change by simply switching to efficient light bulbs, today’s guests believe that you can’t fix the broken food system by simply growing a backyard garden. It requires redesigning our food system. 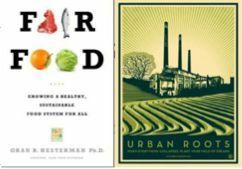 My first guest, ORAN HESTERMAN has a new book FAIR FOOD, a guide to changing not only what we eat, but how our food is grown, packaged, delivered, marketed and sold. Hesterman opens the book talking about Detroit, Michigan, an unlikely beacon of hope in the fight for fair food. Prior to starting the Fair Food Network, where he is President & CEO, ORAN HESTERMAN was the inaugural president of Fair Food Foundation, leading their sustainable food systems programs. Before that, he researched and taught in the crop and soil sciences department at Michigan State University in East Lansing, and for more than 15 years he co-led the Integrated Farming Systems and Food and Society Programs for the W.K. Kellogg Foundation, during which time the Foundation seeded the local food systems movement with over $200 million. FAIR FOOD is his first book. My second guest LEILA CONNERS, a founder of Tree Media in Santa Monica, is a producer of URBAN ROOTS, a documentary on the food revolution taking place in Detroit. Directed by Detroit-native Mark McInnis the film tells the powerful story of a group of dedicated Detroiters working tirelessly to fulfill their vision for locally-grown, sustainably farmed food in a city where people — as in much of the county — have found themselves cut off from real food and limited to lifeless offerings of fast food chains, mini-marts, and grocery stores stocked with processed food from thousands of miles away. LEILA CONNERS is Founder and President of Tree Media Group. Conners is director, producer, and writer on THE 11TH HOUR, as well as the short films “Global Warning” and “Water Planet” (all with Leonardo DiCaprio). She was Associate Editor at New Perspectives Quarterly and Global Viewpoint, focusing on international politics and social issues. She is producer of URBAN ROOTS.